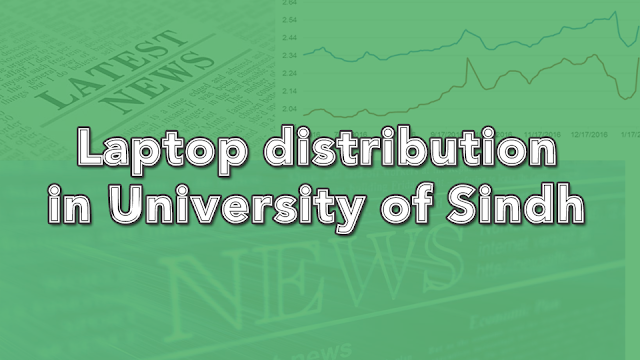 These days, the laptops distribution season is in full swing and all over the country, the universities are organizing ceremonies for the laptop distribution. Some days before, in Karachi University, the ceremony took place and now all in all Sindh universities, HEC is handing over the laptops. The management of Sindh University, Jamshoro has decided to distribute the laptops under the PM laptop scheme till July 1 among the M.Phil and PhD scholars. A ceremony was also held at Department of Freshwater Biology and Fisheries, from where the distribution has been started. In the ceremony, the focal person of PM laptop distribution scheme, Dr. Wazir Ali Baloch and VC of Sindh University, Prof. Dr. M. Siddique kalhor along with a large number of teachers and students participated in the ceremony. In his speech, the VC of the Sindh University said that students should play a constructive role for the development of country as they have responsibilities on their shoulders. He thanked the federal government for considering the students from university of Sindh for the program and said that this scheme is in second phase and laptops will be given to students of bachelor and masters programs also, along with M.phil and doctorial students.He hoped that students with the laptops will try to promote research in university and they can get benefit from the million of books and research articles on the internet. He added that scholar now have to ensure their access to the E-book, articles along with newspaper and magazine for the research work. On the occasion, the Focal person of HEC Wazir Ali Baloch said that it is indeed the wisdom of the prime minister to introduce the PM laptop scheme as with which, laptops are being distributed in the universities so that research culture could be promoted. He added that many laptops have been purchased for the distribution and under the scheme 3661 laptops are being given to the Sindh University for their students. He said that with the decision of laptop distribution among students, they will be able to conduct research with the use of internet and can give good results.He further said that this initiative will upgrade the quality of higher education in the country. The universities, however, should also educate the students through learning session about the correct usage of this device as internet contains a large amount of harmful material for them so parents and teachers guidance is necessary. HEC should also include the introductory video in the laptops so that the correct usage could be ensured.